Congrats! You have decided to start blogging! Welcome to the blogosphere! Did you pick a name for your blog yet? 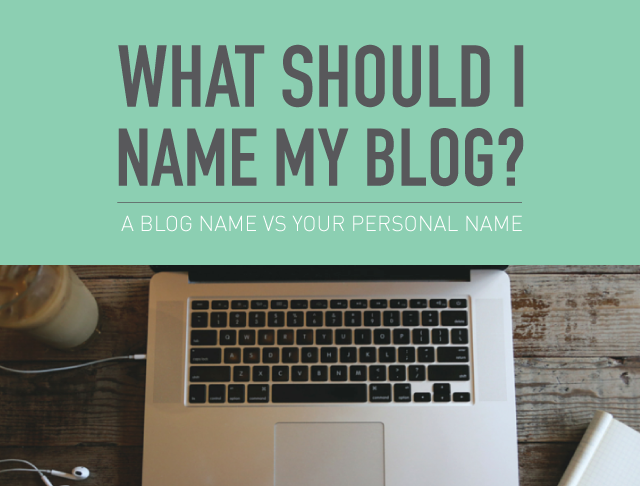 Or, perhaps you’re having your first blogging dilemma and asking yourself: What should I name my blog? Don’t let panic stop you from starting your blog; by the end of this post you will have the answer. I am here to help you! It sounded perfect! Until I started typing it as a domain. Too long! And I found another blog with a similar name. I kept brainstorming and researching and while I couldn’t decide on a name, the more blogs I visited, the more excited I got. I realized that I wanted to blog beyond my thirties, hopefully for the rest of my life. I also felt that my blog could become a book one day (coming soon! ), therefore as an aspiring author, I needed a name that could stay with me forever. There was only one answer to that: My own personal name. And that is how www.laurasgroi.com was born. The domain was available and I purchased it even before I wrote my first post. The cherry on top? I chose a theme that displays my site title and tagline, which means I can tell readers what they can expect from my site as soon as they land on my site. Plus, I can modify it as my message and me evolve. Success! With time, I learned that using my name for a blog has its pros and cons. It has developed my personal brand and platform, although once in a while I wish I could review products or write anonymously about certain delicate topics and I can’t. Plus my last name is difficult to pronounce! Picking a blog name would have had its positives and also negatives. A creative and catchy name could make the concept of the blog almost self-explanatory for my audience, but what if my message changes along the way? Picking the right domain is a personal choice. Whatever works for you is the best choice. Yet, knowing this truth doesn’t make the process any easier! In an effort to help you find clarity, I’ve compiled a list of questions you can ask yourself, which will get you closer to a decision. An individual looking to express your own views, feelings, and creativity? Or are you building a personal brand as a public figure, leader, expert or influencer for a niche audience? In that case, use your personal name, or at least buy the domain for it and direct it to your blog if you decide on a blog name. You can also play with your name or nickname as part of your blog name, i.e. : www.cupofjo.com by Joanna Goddard. Or vice versa, you might love your blog name so much that you eventually change your personal name like Gala Darling did! Are you writing for yourself or for a business? If you blog to create awareness for a specific product or a service, the business brand should be the blog name and you might not be the only one writing. If you are a freelancer blogging to attract contacts and work in your industry, I recommend using your personal name. Or if you’re looking to share a certain aesthetic for a specific crowd, like a magazine would, you might want to consider a fun name. 3. Are you planning to monetize your blog? If yes, what would be your business model? If you want your blog to be considered a media outlet and sell advertising and sponsorships, consider a blog name. If you are planning to write a book, become a public speaker and/or create courses based on your expertise, consider using your personal name. 4. Are you being practical? Once you decide on a name, you’ll want to check if that name is also available on social media platforms. Also, is it easy to remember and spell? Female bloggers: are you married yet? If not married, would you take your husband’s last name when you tie the knot later? I know these questions may sound like a lot of future thinking, but the more planning you can do now the better. These are the questions I learned to ask, so I hope they help you as well. Overall, take your time; it’s worth it. Answer the questions above from your heart and you will choose the best way: Your way. Communications Expert, Blogger & Author of upcoming book "Now That I Am in My Thirties", embracing this decade and sharing inspiration and expert advice on what matters most!